erfect conditions greeted the 4,300 participants at the Air New Zealand Hawke’s Bay International Marathon this morning, with little wind, high light cloud and warm autumn morning temperatures making for an idyllic setting as runners made their way from their various event start lines to the finish at Sileni Estates Winery in Hastings. Highlights on the day included the amazing sight of multiple Rio Paralympics gold medalist Liam Malone completing his first marathon, overcoming incredible pain along the way. There were record breaking times in the men’s New Zealand Sotheby’s International Realty Half Marathon and women’s Cigna 10km races, and amazing stories throughout the fields, including kidney transplant recipient Matt Toole (Wellington), who completed the Cigna 10km event in style this year. 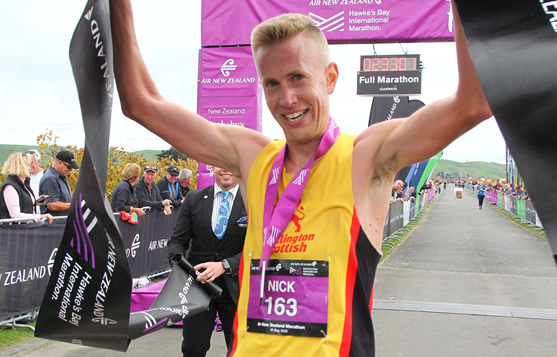 Nick Horspool (Wellington) took out the men’s Air New Zealand Marathon in 2:32:51 as he prepares for the Oceania Marathon Championships on the Gold Coast next month. “My dad moved to Havelock North a couple of years ago, we have been coming up with the kids for visits and I have always wanted to do this event and the timing worked out well this year. Today was fantastic, nice and calm, perfect conditions, I really enjoyed it. 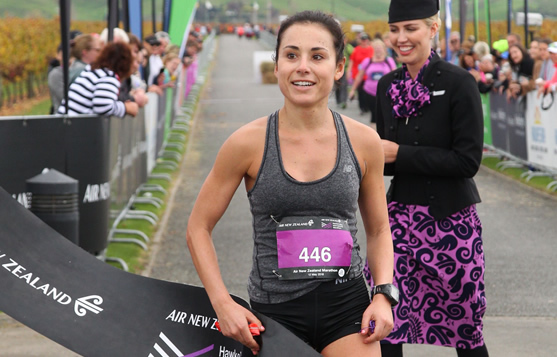 Women’s Marathon winner Sabina Paris was on her first visit to Napier, the San Diego native made the trip down from her current base in Auckland and loved every minute of the journey, coming home in3:11:19. Without question though one of the highlights of the day was the sight of multiple Rio Paralympic Games gold medalist Liam Malone bounding down the finish chute into Sileni Estates Winery on the same blades that swept him to glory in 2016 – albeit they were a little worse for wear after the longest run that Malone has ever taken on. Malone is renowned for his positive attitude and fighting spirit though, and it served him well on such a draining day, as he finished in 4:47:28. “There was never a doubt in my mind that I was going to finish, I was always going to finish, I could have crawled. Along the way I was skipping because I was in so much pain in my left leg, I was trying to take the weight off it. I broke it into small milestones in the distance and said – I have to get to there, and then the next one and I just kept going like that. The Malone sense of humour was close to the surface too, as he joked at his own expense and yet at the same time encouraged people to take nothing in life for granted. There were two new race records on the day, first in the women’s Cigna 10k, with current half record holder Laura Nagel clocking 38:08 to win the shorter distance today. Meanwhile in the men’s New Zealand Sotheby’s International Realty Half, Daniel Jones (Wellington) flew home in 1:07:43, taking almost five minutes off the previous race record. “I’d say we have the best weather in the country today, you can’t ask for more, overcast, not too hot and maybe a slight head wind. It mixes things up though when you run around and through the vineyards, it is a bit unique and pretty special to be in this part of the country doing a half marathon here and racing your guts out in front of so much support on the course, it was great,” said Jones. Matt Toole (Wellington) raced with a new kidney spurring him on in life, as he took on the Cigna 10km event. 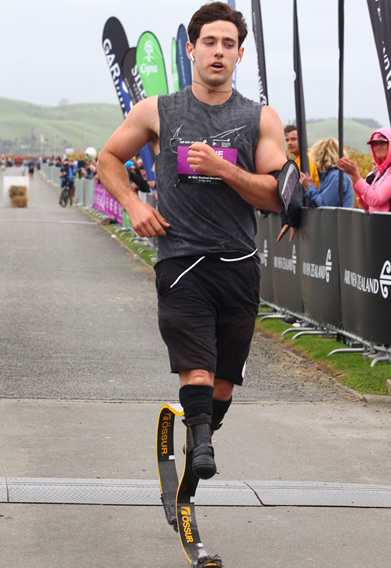 In 2017 Toole completed the same course with his then kidney operating at about 10%, he has since had a full transplant and returned with the aim of finishing in better shape to greet his mum at Sileni Estates Winery.